To send SMS Landing Pages messages via Messaging Studio, you must upload your recipients as a spreadsheet (csv, xls or xlsx). Correct formatting of the data on this spreadsheet will save you time and ensure all messages are delivered. The only column you must include in your spreadsheet is a list of mobile numbers. This is because I selected the ‘My phone numbers are internationalised, add the + sign for me.’ option, which was correct for Warren and Amy, but for Liz’s number, I needed to include the + sign and the country code. 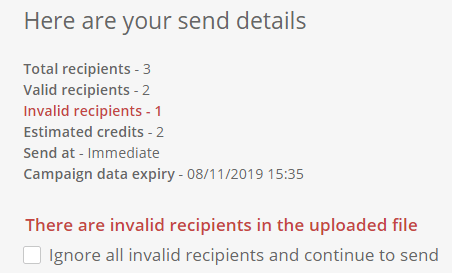 So, it’s important to format your database before you send to ensure that all numbers are either prefixed with the country code, or not. You also need to ensure that you haven’t included non-numerical data in your spreadsheet, such as the brackets in this example: 44 (0) 7870 154 769. We have a handy infographic to help you format your data – this is for our Echo SMS platform but the steps are the same for Messaging Studio. You can find out more about personalising your templates here.